Studying lampreys allows biologists to envision the evolutionary past, because they represent an early offshoot of the evolutionary tree, before sharks and fish. Despite their inconspicuous appearance, lampreys have a sophisticated immune system with three types of white blood cell that resemble our B and T cells, researchers have discovered. Scientists at Emory University School of Medicine and the Max Planck Institute of Immunology and Epigenetics in Freiburg have identified a type of white blood cell in lampreys analogous to the “gamma delta T cells” found in mammals, birds and fish. Gamma delta T cells have specialized roles defending the integrity of the skin and intestines, among other functions. The results are published in the journalÂ Nature. The finding follows anÂ earlier studyÂ showing that cells resembling two main types of white blood cells, B cells and T cells, are present in lampreys. In the human immune system, B cells can differentiate http://www.raybanoutletit.com/ into antibody-secreting cells and can grab their targets directly, while T cells generally recognize their targets only through cell-to-cell contact. 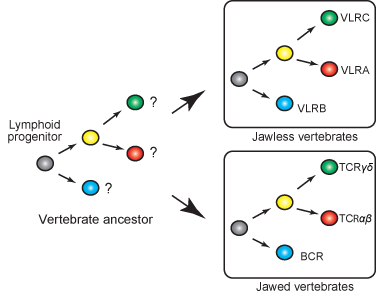 Hirano says the results indicate that distinct cells with functions that are similar to gamma delta T cells may have existed in the last common vertebrate ancestor, before jawed and jawless vertebrates diverged around 500 million years ago. The senior author of the paper is Max Cooper, professor of pathology and laboratory medicine at Emory University School of Medicine and the Emory Vaccine Center, and a Georgia Research Alliance Eminent Scholar. Thomas Boehm, group leader at the Max Planck Institute and colleagues were contributors to the paper. B and T cells are the foundation of the adaptive immune system, allowing mammals, birds and fish to respond to a wide variety of pathogens and “remember” what theyâ€™ve encountered. B and T cells produce characteristic proteins: antibodies (for B cells) and T cell receptors. These proteins have modular sections that are variable from cell to cell, but they share structural and sequence similarity across species. Lampreys’ white blood cells produce proteins with a broad diversity and function comparable to antibodies and T cell receptors, but in contrast, these variable lymphocyte receptor (VLR) proteins do not look like antibodies structurally. Cells that produce VLR-A proteins are roughly comparable to T Ray Ban online cells, while VLR-B-producing cells resemble B cells. Cooperâ€™s laboratory recently characterized the structure and assembly of a third set of VLR-C genes, in addition to the VLR-A and VLR-B gene families. In the newÂ NatureÂ paper, the authors show that VLR-C proteins are found on a third type of white blood cell that do not produce the other VLR varieties. These VLR-C-positive cells are the predominant white blood cell type found in lampreysâ€™ skin. They are also more abundant in lamprey larvae. Many of the VLR-C proteins found in the lampreysâ€™ skin displayed the same or almost the same protein sequence. This restricted diversity resembles that of gamma delta T cells found in the skin of mammals. In addition, lampreysâ€™ VLR-C-positive cells have activated some of the same genes that, in mammals, control the development of gamma delta T cells. The research was supported by the National Institute of Allergy and Infectious Diseases (AI072435), the National Institute of General Medical Sciences (GM100151), the Georgia Research Alliance and the Max Planck Society.